Pápai Páriz Ferenc, Album amicorum p. 217. Lud[ovicus] Georg[ius] Treviranus Eccl[esiae] Neap[olitanae] Brem[ensis] pastor. Bremae die 27 7bris 1714. * Mt 5:6: Vulgate: “Beati qui esuriunt et sitiunt iustitiam, quoniam ipsi satiabuntur”. In Bremen, September 27, 1714. [written through pp. 216-217:] These pages will forever bind [us]. 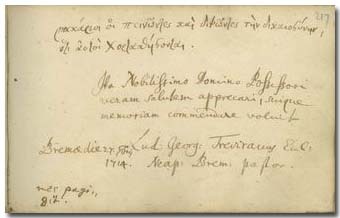 Ludwig Georg Treviranus was born in Speyer on January 6, 1676. He studied in Heidelberg, and in 1698 became court pastor of the Prince of Anhalt-Bernburg, in the castle of Schaumburg bei Lahn, near to the town of Diez. In 1701 he went to Nassau, but three years later he was invited pastor of Holzappel. In 1708 he settled in Bremen. He became pastor of St. Paul's Cathedral, and his sermons attracted many people. He taught cathecism, and was the first pastor to introduce confirmation and the instruction preceding it. Although he was an orthodox Calvinist, he was also influenced by spreading Pietism. He was much attacked because of a sermon of him published in 1720. He treated the question of universal salvation in an eirenic mood, in the spirit of the conciliation between Lutheran and other confessions: by doing so he won the sharp controversy of the Lutheran Bishop Gerhard Meyer. He died on July 16, 1757 in Bremen. He was the founder of that widespread family which gave famous natural scientists and politicians, many of which played a role in the history of Bremen. (For example, Gottfried Reinhold T., 1776-1837 coined the word "biology"; a later Gottfried Reinhold T., 1891-1971 was a minister of the Republic of Weimar, and a Reichsminister). His popular works were: Ruhm der Gläubigen in dem Tode Jesu gegen alle Verdammniss, Röm. 8, 34, 1720. – Lud. Georg Trevirani … unumgänglich-nothwendige Verthaidigung Seiner a. 1721 über Röm. 8:34 in druck gegebenen Predigt Gegen die von weiland D. Gerhard Meyer gewesenen Superintendenten … Bremen, 1726. - Die Wahrheit in Jesus, angewiesen aus denen so genannten sonntäglichen Evangelien durch das gantze Jahr … Bremen, 1719. – Der Beruff und verschiedene Lager-Plätze des Erzvaters Abraham … Bremen, 1738.